Fountaingate Gardens, a proposed continuing care retirement community (or CCRC) to be built in Commack, has been working on planning the flexible dining program that will allow you to choose when you want to cook, and when you would like to be served in one of three dining venues, including a formal restaurant, casual bistro, or alfresco. 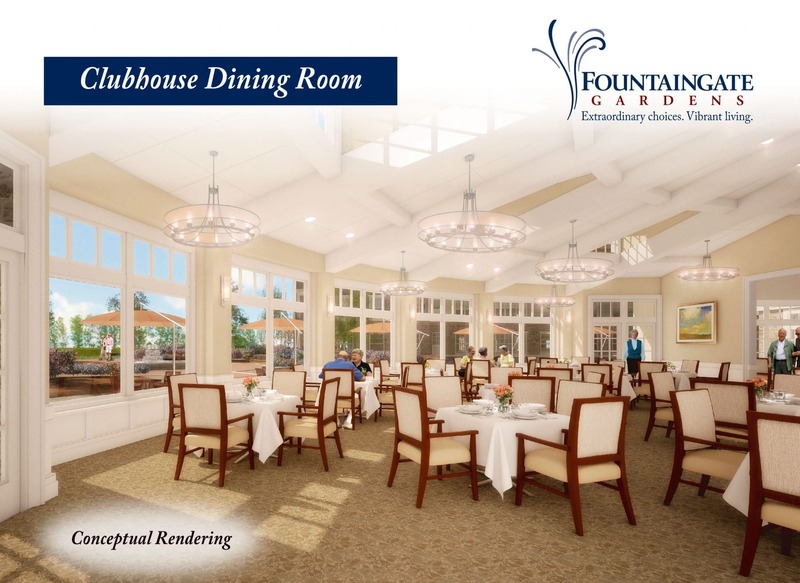 While the specifics are not yet finalized, dining services at Fountaingate Gardens will include delicious chef-prepared meals and snacks, including Sunday brunch, served in formal and casual settings. The Clubhouse Bistro will be the place to go to enjoy a steaming cup of java and a wide selection of tasty offerings prepared by the chef and his talented team. The restaurant-style dining room, with a well-trained wait staff, will cater to your needs as you enjoy a relaxing meal in the restaurant-style dining room. There, you will be able to choose to sit on the outside patio in fair weather, or, if you prefer, to stay indoors and sit near the large windows – featured in this rendering – that will overlook the beautifully landscaped pond and garden. With all these delicious options, which dining option seems most appetizing to you? To learn more about Fountaingate Gardens, or to see more renderings, call our friendly team at (631)210-5806, fill out the Contact form, or visit our Information Center at 50 Hauppauge Road, Commack, New York 11725. We look forward to speaking with you!